In simple AC power systems, one of the two conductors is typically called the hot, while the other conductor is typically called the neutral. 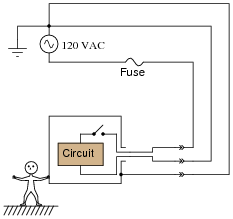 What distinguishes the "hot" conductor from the "neutral" conductor in such a system? In other words, what exactly determines whether a conductor will be called either "hot" or "neutral"? Follow-up question #2: explain how to use a multimeter to identify the "hot" and "neutral" conductors of a power system such as this. Ask your students what safety issues surround the "hot" and "neutral" conductors, respectively. What do the names imply about relative hazard, and why is this? Ask them to explain how these safety considerations impact the placement of the overcurrent protection device. 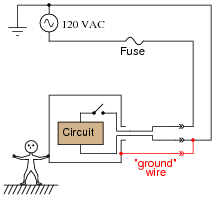 Explain why most electrical power systems have one of their current-carrying conductors connected to earth ground ("grounded"). Why not just leave all power conductors ungrounded? Would this not reduce electric shock hazard? 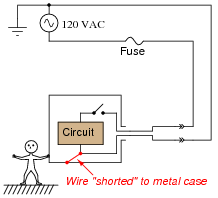 Even though no shock hazard presently exists in the circuit, ask your students to identify a condition where the ßhorted" wire inside the appliance would pose a shock hazard. What would have to change in order for this wiring fault to pose a hazard? Yes, if the power switch is turned ön". 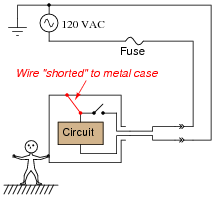 Aside from removing the ßhort" connecting the power conductor to the metal case of the appliance, what else could be done to eliminate the shock hazard in this scenario? Discuss this with your students. Ask your students to explain why the case's electrical commonality with earth makes it safer to touch. What do they know about ëlectrically common points" in a circuit, and voltage between those points? A "polarized" power plug is one that is designed to plug into a power receptacle one way only (i.e. it cannot be reversed). Usually this is accomplished by the use of one "prong" on the plug being wider than the other, with matching-width holes in the receptacle. But why not eliminate all that extra wiring, and simply connect the third hole on the power receptacle to the "neutral" wire? Using the neutral conductor as a safety ground is a bad idea, in the event the neutral wire were to ever fail öpen" between the receptacle and the system ground point. In the United States of America, the National Electrical Code (NEC) specifies certain color codes to be used for designation of grounded, grounding, and ungrounded wires in AC power systems. First, relate the terms "hot," "neutral," and "ground" to the terms "grounded," "grounding," and üngrounded". Then, describe the acceptable color codes for each conductor. Also, note the article and section of the National Electrical Code under which these specifications are found. I'll give you this hint: no more than two voltage measurements are necessary to identify all three jacks in a properly connected three-prong power receptacle! Special safety devices called Ground Fault Current Interrupters, or GFCI's, reduce the risk of shock hazard in electrical systems even where there is no ground conductor. Explain the operating principle of a GFCI. How are they able to sense a "ground fault" condition, so as to automatically turn off power to a receptacle? "GFCI" devices work on the principle of differential current measurement as a means to sense ground faults. Be sure to discuss with your students what "differential current measurement" means, rather than assume they all researched the answer in greater detail than what is provided here. This really is a clever way to detect the presence of a ground fault! You should point out to your students that GFCI power receptacles are commonly installed in "wet" areas of residences, such as in the bathroom and outside, where the hazard of ground-fault electric shock is maximized by the presence of water. Suppose a GFCI is rated to "trip" with a ground fault current of 5 mA. 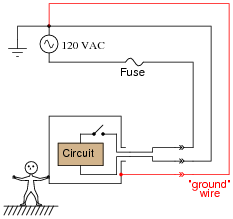 Given a source voltage of 115 volts, calculate the ground fault resistance range required to trip. This question requires the use of Ohm's Law, but to calculate a range of resistance values and not just a singular value. All students should be able to obtain the figure of 23 kW, but some may be confused as to whether this is a minimum or a maximum resistance value needed to trip the GFCI. Discuss this with your students, asking them to explain how we know 23 kW is a maximum figure and not a minimum figure. I once watched a television advertisement for an electric drill, in which one of the people selling this product claimed it was "double-insulated," to which the other person replied, "So it doesn't get hot in your hand, right?" What do you think of this comment? Is this what "double-insulated" means? While this advertisement was amusing, it was not very informative. No, the term "double-insulated" does not refer to thermal insulation, but rather electrical insulation. One fact of interest here is that double-insulated tools usually do not have three-prong power plugs. In other words, they do not need a "ground" wire to ensure operator safety.